When sixteen-year old, Jae Hwa, is uprooted from her home in L.A. to Korea, she thought her biggest problem would be fitting in with her classmates and dealing with her dismissive grandfather. But she was wrong. A Korean demi-god, Haemosu, has been stealing the soul of the oldest daughter of each generation in her family for centuries. And she’s next. After teaching and traveling internationally for ten years, Christina started writing about her adventures, tossing in a little fiction for fun. This inspired her to write GILDED, a YA based on Korean mythology about a Korean-American girl who takes her destiny into her own hands. Christina writes fantasy for teens. Her debut YA, GILDED, will be published by Skyscape/Amazon Children’s, spring 2014. She is represented by Jeff Ourvan of the Jennifer Lyons Literary, LLC. Love the cover! The name reminds me of a gilded cage. The story sounds amazing, can't wait to read it. Sorry the title doesn't remind me of anything but love love the cover it looks gorgeous this book looks and sounds awesome! thanks for the great giveaway! I also was reminded of a gilded cage. The summary was great too. This sounds like a very interesting read. I am reminded of Shakespeare's King Lear. "We will all laugh at gilded butterflies". Hmm, I can't think of anything that reminds me of it. It doesn't remind me of anything. Sorry! Thanks for the giveaway! The title reminds me of a cage. I love the pretty cover. When I first saw it, I read 'Guild' and the first guild I thought of was Sovereign. It's a kind of inside thing between me and a couple of friends though. Reminds me of a gold & riches. What comes to mind is a cage made of gold, a palace run by an evil king. Basically, someone living in luxury but unable to be happy or do what they want most. Things coated in gold. Yay! I have no clue, but the bird on the cover is really cool! I like how the author was inspired by Korean Mythoology, I love Korea! A cage. This book is a perfect story for my daughter. I cant think of what it reminds me but I love the cover!! its gorgeous! The title reminds me of metal. Horses lol I don't know! The title reminds me of the Gilded Age (period approximately spanning the final three decades of the 19th century in the U.S.), the sentimental ballad "A Bird in a Gilded Cage," and gilding the lily. 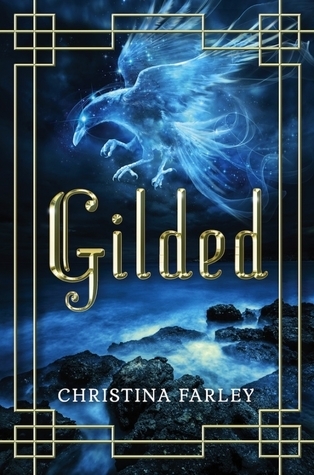 I didn't even know what Gilded meant until I googled it after reading another book, but now it just reminds me of crowns and castles!